An initial batch of four Nikolai Kuznetsov NK-32-02 turbofans is set for delivery to the Russian defense ministry by the year-end, according to Alexander Artyukhov, general director at the United Engine Corporation (local acronym ODK). Earlier this month he inspected the ODK’s Kuznetsov Plant in Samara where production lines have been re-opened to build turbofan and turboprop engines powering Tupolev strategic bombers. The plant has recently secured an order for 22 more NK-32-02s, he added. These are intended for Tu-160M2 and Tu-22M3M swing-wing aircraft. ODK is also working on the NK-12MPM, a further development of the NK-12 turboprop series, with the intention of installing it in the Tu-95MS "Bear-H" strategic bomber. According to a recent statement by ODK’s parent Rostec corporation, the improved engine gives a boost in take-off performance and payload-range capability. The NK-12MPM would develop higher power than the 15,000 shp of the previous NK-12MP production standard. To cope with the extra power, the Aerosyla company is working on a redesigned AK-60T propeller that would replace the AV-60K and halve vibration levels. The initial NK-12 design appeared more than half a century ago, providing the basis of a large family. Today, the NK-12MV and MP versions are in use on the Tu-95MS and Tu-142 ASW aircraft, while the NK-12MA powers the Antonov An-22 Antei heavy lifter. It remains to be seen whether the NK-12MPM will also find application on the latter two aircraft types. While the Russian defense ministry has announced no plans to upgrade the surviving An-22s, it did so in relation to the Tupolev designs. According to a statement earlier this year by deputy defense minister for procurement, Alexei Krivoruchko, the Russian navy will receive its first Tu-142 after upgrade at the Taganrog plant. Following last year’s withdrawal of the eight Tu-142MKIs from Indian navy service, Russia remains the only operator of the type. Out of a 100-unit production run, two dozen aircraft remain operational. The Russian navy plans to upgrade all of the surviving fleet into Tu-142MRM and Tu-142M3M variants by 2020. Meanwhile, the Russian Air and Space Force (VKS) still operates 60 Tu-95MS bombers, including over a dozen that have been upgraded into the MSM version since 2013, with an eventual total of 35 MSMs planned. Initially, the work was carried out at Tagangrog, but since 2015 it has been the responsibility of the Aviacor plant in Samara, which used to manufacture the Tu-95. The enterprise rolled out its first upgraded aircraft in the fall of 2015. Since then Tu-95MSM RF-94122, named “Dubna”, has served for operational trials. This past summer, UAC president Yuri Slyusar said that the Russian engineers were working on solutions to replace Ukrainian parts in the Tu-95MS fleet. He envisioned two phases of modernization. First phase would see Ukrainian parts replaced with Russian-made ones. The second phase entails work that prolongs the Tu-95’s service life for another 35 years. 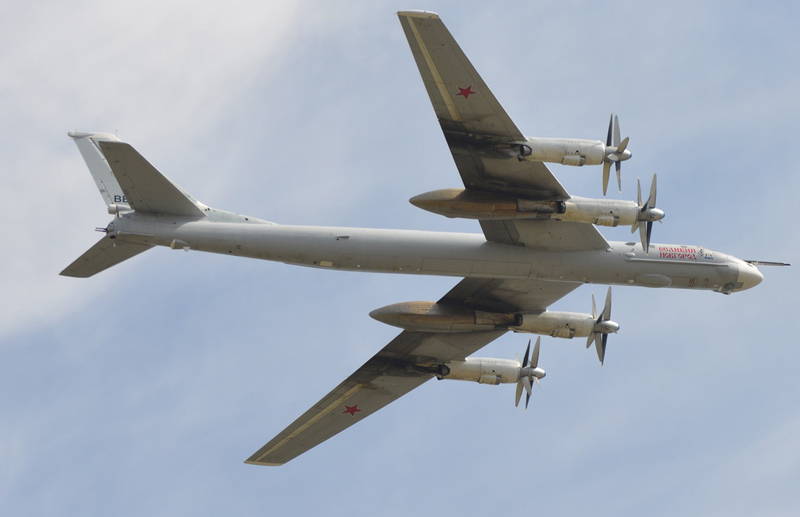 The upgraded Tu-95MSM differs from the Tu-95MS, of which production terminated in 1992, by having an enlarged internal weapons bay to accommodate the new Kh-101/102 cruise missiles, and additional underwing pylons. There are "lsotechnology" insertions to the mission equipment, navigation, avionics, combat management, and information display systems. The U009 Obzor radar is replaced by one from the Novella series featuring phased arrays with electronic beam-scanning. Should a Tu-95MSM refurbished with the NK-12MPM engines pass state acceptance trials with the Russian defense ministry, the customer will add NK-12MPM with AV-60T propellers to the list of upgrades due for introduction on Tu-95MS bombers undergoing work at Samara.